On the 31st of March, we celebrate the dies natalis of Mother Maria (Skobtsova), a beloved martyr and witness to Christ among the Russian émigré population in France. Her Essential Writings are particularly recommended during this Lenten season, as her essays, though brief, are spiritually and personally challenging on a number of levels. They should also certainly be of interest to the good folks of Solidarity Hall and The Dorothy Option, given the close association she has with the radical Roman Catholic Servant of God with those who have studied her life and martyrdom. My apologies in advance to my readers – but if I quote Mother Maria directly once too often herein, please understand that it is not due to a lack of reflection on my part so much as an awe of the depth of her work, that I cannot bring myself to express her ideas better than she expresses them herself. But the association Jim Forest of the Orthodox Peace Fellowship (which hosts a considerable collection of resources on her life and works) makes between her and Dorothy Day is not at all coincidental. Her life, like that of Dorothy Day, was decidedly not what one might expect of a saint, though of course no two saints are ever completely alike. She had been in her youth a member of the left-populist, peasant-driven Socialist-Revolutionary Party which had been outlawed by Trotsky, and lived its fate in an all-too-personal way. She narrowly avoiding execution in late 1917 after her party was disbanded, was talked out of attempting to assassinate Trotsky, ended up the deputy mayor of the small town of Anapa in Krasnodar, was captured by the White Army and put on trial as a Bolshevik, and saved again from the gallows by Daniel Skobtsov, a judge who would become her second husband. Their family fled first to Georgia, then to Yugoslavia, and finally to Paris. 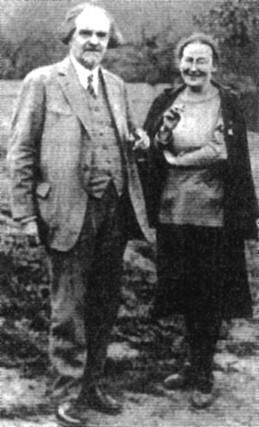 Even though she had no taste at all for Marxism after her run-in with Trotsky, and though she came to abhor the brutalities she witnessed in her role in the Russian Revolution, as Olivier Clément writes, she ‘became a Christian without ever having stopped being the socialist revolutionary, an intellectual of leftist bent’. Her exile and the tragic death of her daughter to illness led her to take monastic vows which, though canonical, were nevertheless highly idiosyncratic. She lived the ‘new monasticism’ in an unfurnished rented house, amongst her fellow émigrés in the world, which she took to be her cloister. She dedicated herself to an active nonpossession, and kept the door of her house always open to the poor, the unemployed, the sick, the orphaned, the homeless, the mentally-ill; she gave of herself and everything she had to those who needed her help. She also organised discussions on philosophy and on the Orthodox faith from her house, and she maintained close friendships with a number of people in the Russian émigré community of Paris: the philosopher Nikolai Berdyaev, her confessor Fr. Sergey Bulgakov, and the historian Georgiy Fedotov. During the Second World War, her house became a refuge for Jews, and she and Fr. Dmitri Klepenin, another spiritual son of Fr. Sergey Bulgakov and the chaplain of her house, would give baptismal certificates to Jews who sought to flee the country. Eventually the Gestapo shut her down and sent her, along with Fr. Dmitri, her son Yuri, and her friend Ilya Fondaminsky – all of whom eventually met their martyrdoms in Nazi concentration camps. Mother Maria was sent to Ravensbrück, and was eventually put to death in the gas chambers. It is said in some of her hagiographies that she took the place of another woman, a Jew, who had been assigned to be killed that day. During her life and in her martyrdom, the faith she lived in service to the poor and the faith she discussed in the émigré circles were one. She was devoted to the Mother of God, and even painted an idiosyncratic variant of the ikon of the Mother of God Akhtirskaya, portraying the Holy Theotokos embracing the crucified body of Christ her child. Perhaps drawing upon her own experience of losing her daughter, she offered her motherly kindness, as a nun, to a suffering world without reservation or exception. She was insistent that the love of God could be lived only through a radical openness to the sufferings and the struggles of one’s neighbour – that only through keeping the second commandment of Christ in the Gospel could the first even become possible. And throughout her writings, she holds up and defends from a Patristic basis the Russian religious-philosophical idea of sobornost’, of radical dynamic community which is at the same time freeing and completing of the person who participates in it. In fact, mankind has enough experience of the two opposing systems of coercion and violence. The old coercion of the capitalist regime, which destroys the right to life and leaves one only with the right to labour, has recently begun to deprive people of that right as well. Forced crisis, forced unemployment, forced labour, joyless and with no inner justification—enough of all that. But try going to the opposite system. It turns out to be the system of communist enforcement: the same joyless labour under the rod, well-organised slavery, violence, hunger—enough of that, too. It is clear to everybody that we must seek a path to free, purposeful and expedient labour, that we must take the earth as a sort of garden that it is incumbent upon us to cultivate. Who doubts that? A person should have a more attentive attitude to his brother’s flesh than to his own. Christian love teaches us to give our brother not only material but also spiritual gifts. We must give him our last shirt and our last crust of bread. Here personal charity is as necessary and justified as the broadest social work. In this sense there is no doubt that the Christian is called to social work. He is called to organise a better life for the workers, to provide for the old, to build hospitals, care for children, fight against exploitation, injustice, want, lawlessness. In principle the value is exactly the same, whether he acts on an individual or a social level; what matters is that his social work be based on love for his neighbour and not have any latent career or material purposes. The social element of Christianity is, indeed, for her so inseparable from the core of Orthodox spirituality and the Gospel message, that she even criticises those Christians of like mind to her, who base their actions and their programmes not on the basis of an authentic Orthodox Christian (or Catholic, or Protestant) witness but instead upon the false ground of secular humanism. The most doubtful, disputable and unsatisfying thing about all the concepts of… ‘social Christianity’… is their secondary character, their incommensurability with the idea of Christian life understood as communion with God. … All the trends of social Christianity known to us are based on a certain rationalistic humanism, apply only the principle of Christian morality to this world, and do not seek a spiritual and mystical basis for their constructions. To make social Christianity not only Christian-like but truly Christian, it is necessary to bring it out of flat soulfulness and two-dimensional moralism into the depths of multi-dimensional spirituality. To substantiate it mystically and spiritually. It seems to me that this coincides precisely with what Orthodoxy—which has not yet spoken in this area—can and must say; it will give greater depth to Catholic and Protestant attempts to turn a Christian face to the world. Throughout Mother Maria’s work there is always this similar challenge. Typically of Russian religious philosophy, Saint Maria places upon herself the demand of complete commitment, and will brook no compromises or comfortable lies. The Christian life is not truly or fully Christian until it ‘faces the desert’, an image to which she, being well-versed both in the Desert Fathers and in the ‘holy fools’ of the Church, continually returns. The reality of the Russian exile haunts her every page, and she is keenly aware of it. She writes with very few comforts for those Orthodox exiles who want to withdraw and take refuge in the old trappings of the state, of ritual, or of the æsthetic forms of Church life; she calls them instead – lovingly, but insistently – to the radical witness to Christ’s life and death in their own lives. And yet there is also all too much in Mother Maria’s writings to discomfort and disorient those who are expecting to see in her a liberal and an œcumenist. She was neither. Early in her life she was a penpal of the arch-traditionalist Ober-Procurator of the Most Holy Synod of the Russian Orthodox Church himself, Konstantin Pobedonostsev; Olivier Clément alludes that it was from him that she learned the personal ‘love of neighbour as opposed to love of those far away’. The three authors she alludes to most fondly are Aleksei Khomyakov, Fyodor Dostoevsky and Vladimir Solovyov, and it’s clear that she has absorbed much of their romantic-conservative Slavophil temperament. She has some notably harsh words for ‘godless and giftless… cool, uncreative, imitative… secular democracy’, which in her mind amounted to a form of ‘mystical totalitarianism’. In the fog of the Second World War, she sees straight through those who claimed – and indeed, still claim in modern times, in the case of the EU and NATO – to be ‘defending the right cause, fighting for the liberation of national minorities, or for the federal organisation of Europe, or for democracy’. Not only does she bluntly say that these things are ‘not enough’, but she deliberately likens them to those pitiable flights of fancy to which Dostoevsky’s Underground Man was prone, and further posits that no one truly wants to or should die for such milquetoast abstract ideals: ‘your life is greater and your death is greater’ than the sum total of these things. The personalism-in-sobornost’ Mother Maria insists on cannot be reduced to such paper-thin abstractions. She speaks with dismay of the ‘religious League of Nations’ whose highfalutin, carefully-worded statements of unity were totally inadequate to halt the advances of fascism and Bolshevism – both ideologies which she deems, referring to the Brothers Karamazov, to be ‘Smerdyakovism enthroned’. And she has some critical things to say – perhaps, from the point-of-view of many readers here, too critical – of Pope Pius XI, whose ‘diplomatic subtlety and refinement’ in addressing German Christians she deemed fatally ill-suited to the spirit of the times, and whom she likens to a ‘sympathetic acquaintance at a funeral’ who is unaware of how the gates of eternity opened at the cataclysmic catastrophe being faced by Europe. And perhaps under the influence of Solovyov, she sees in consistent pacifism ‘something egoistically vegetarian… which makes one sick at heart’. In truth, she rejects, just as Chesterton and Solovyov do, the idea of wars of choice, pre-emptive wars, wars of aggression; she holds the ‘motivation of the robber’ to be utterly incompatible and at odds with the Christian life. But ‘much more complicated’ for Mother Maria, ‘is the question of enduring war, of passive participation, of war in defence’. She is not unaware of the terrible human and civilisational costs of war, and clearly sympathises with the pacifist denunciation of the same. But her maternal compunction is what leads her to pity the most powerless in war, as well as those who come to their defence, and it is what leads her to point to God’s presence even in the worst desolation. And yet it is a privation in which an even more terrible and urgent call is present: the call to again live the Gospel in a meaningful and creative way, without seeking refuge in the pieties of a motherland they no longer lived in, and without succumbing to the ‘spiritual philistinism, spiritual mediocrity, lukewarmness’ of the deadening liberal culture sheltering them. Even more so than when the first Russian monks set out into the wastelands of Siberia, she comprehends the call to a ‘new monasticism’ among the Russian émigrés in the streets and apartment complexes of the totally-foreign cities in which they’ve landed. But even as she sympathises maternally with the plight of her fellow émigrés – ‘hard as it is to say to impoverished people, “become still more impoverished”’ – she still holds forth bluntly the ‘inner command’, that ‘our God-given freedom calls us to activity and struggle’. And Mother Maria was active and struggled to the very last. She was, as Jim Forest rightly notes, a great comfort to those who were imprisoned with her in the ‘hell’ of Ravensbrück. Even in a place where human dignity had utterly stripped away from everyone, even in a place where – to borrow Forest’s description – obscenity, contempt and hatred were as commonplace as hunger, illness and death, Mother Maria provided the inmates with a family and a refuge. She once again organised discussion circles and kept evening prayers, brought French and Soviet prisoners alike together, and shared even what little food she got with those who had still less, until her health failed and her friends would not allow her to give away any more. Mother Maria pointed to God’s presence even in the worst of places and in the worst of times; in many instances, she herself was a great testament to that presence. She lived under regimes of great turbulence, depravity and cruelty. Yet, in spite of them, she witnessed throughout to a much higher ideal worthy of struggle: that of the Kingdom of God as realised in sobornost’. Have received the imperishable crown. Matthew F. Cooper is an AmeriCorps alumnus, ESL teacher and policy analyst currently based in Rhode Island, where he makes up about a third of the bass section in the choir of St. Mary Antiochian Orthodox Church in Pawtucket. He has done some policy writing for PlaNet Finance China, as well as for the Rhode Island Public Expenditure Council; the opinions he rather haphazardly scribbles elsewhere are very much his own, however. He is a contributing editor at the Solidarity Hall thinkerspace, and maintains a blog at The Heavy Anglo-Orthodox, where he meanders about theology, geopolitics, economics, and heavy metal.